Fresh Fruit Fit: Health Benefits of Kiwi! But isn't cool that God created something so sweet and delicious that is actually also super healthy? Yeah it is!! Yes, that's right! One ripe kiwi has over 64mg of Vitamin C which is well-known to boost the immune system. With over 215mg of potassium, the kiwi helps keep your electrolytes in balance without all the acidic by-products created by Gatorade. Oxygen-related damage to the DNA in human cells is no match for the kiwi! 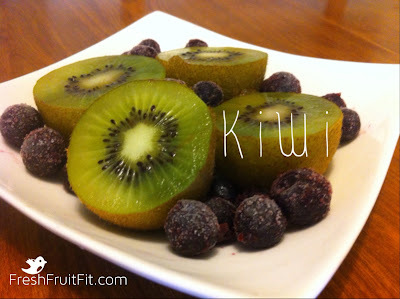 Different compounds of phytonutrients in the kiwi actually prevent the oxidation. Antioxidants, like the kiwi, are known to help prevent heart disease, stroke, and cancer. With the kiwi being low on the glycemic index (only 47-58!) and full of natural fiber, filling up on ripe kiwi will not only taste good but shred the fat and keep you slim. "A study published in Thorax that followed over 18,000 children aged 6-7 years living in Central and Northern Italy found that those eating the most citrus and kiwifruit (5-7 servings per week) had 44% less incidence of wheezing compared to children eating the least (less than once a week). Shortness of breath was reduced by 32%, severe wheeze by 41%, night time cough by 27%, chronic cough by 25%, and runny nose by 28%. "1 So be sure to increase your fruit intake and not your pharmacy runs for more cough medicine and inhalers. **The body is constantly trying to heal itself, so work with it instead of against it. Thank you for posting this. I didn't realize the benefits of eating Kiwi for my asthma. I'm a runner and sometimes it's hard to run. I'm going shopping tomorrow and will pick up some Kiwi and put them in my diet. I figure it can't hurt but only help. I really like eating Kiwi. Thank you again.